Another crazy week and a quarter of NFL football is complete. I would love to sit down and talk with you about your redraft leagues, but we’re here for DFS. So, without any delay, let’s get to it. Chris Carson Mike Davis (28 pts): Last week’s “Steal of the Week” was Chris Carson. He was primed and ready to go. At the last minute, Seattle declared him inactive and Davis started in his place. Hopefully you adjusted when the surprise was announced, since it was a late afternoon game. If you did, your situational awareness paid off in a big way. Davis rushed for 101 yards on 21 carries, caught 2 receptions for 23 yards, and found the end zone twice. STACK / Patrick Mahomes (24 pts) + Travis Kelce (20 pts): If you played the long game, into Monday Night Football, you got what you paid for, but not what you hoped for. Denver put the sophomore to the test and though he and the Chiefs prevailed, his fantasy stats were less than desirable. However, if you played 50/50 or head-to-head, chances are you doubled your money. Carlos Hyde (14 pts): at $5,500, his contribution to your lineup matched his RB2 price tag. With 82 yards and a TD in week 4, Hyde totals 300 totals yards and 5 scores for the first quarter of the season (RB8). Since his ADP was RB25 off the board, he’s one of the year’s draft steals, if he can remain on the field. 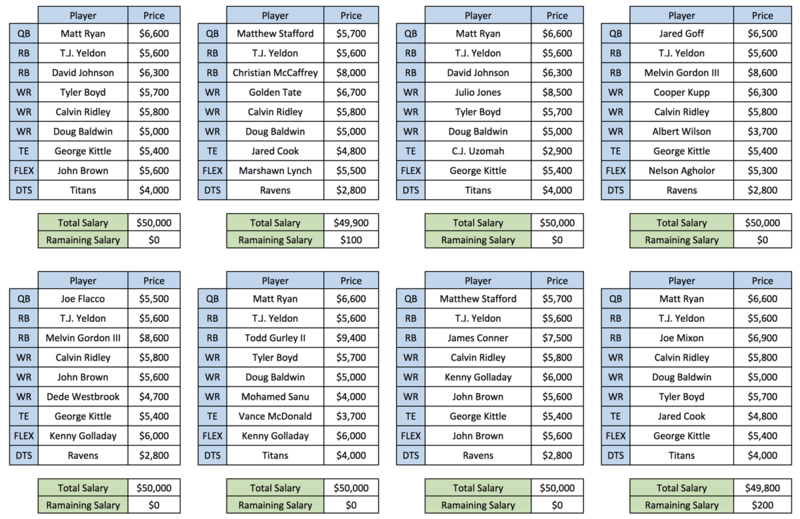 STACK / Baker Mayfield (16 pts) + Jarvis Landry (13 pts): This stack didn’t win you any tournaments, but the lowered price tag of this stack compared to most freed up more bank for top tier RBs and/or WRs. At best, you remained right above the 50/50 line. However, you may have lost your head-to-head games. Eli Manning (16 pts): Eli is the kind of guy that only needs one pin to win the game and he throws a gutter ball, every time. 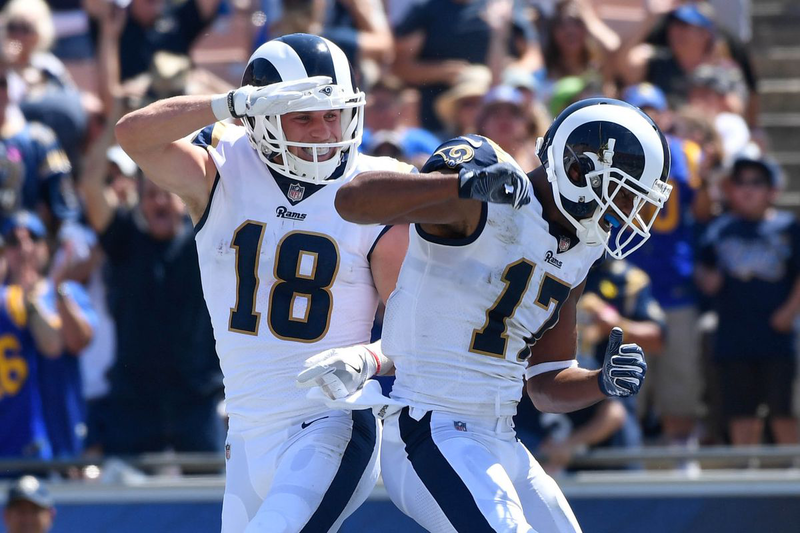 We wanted to believe he could have thrown for 300 yards and 3 TDs, especially considering the tools at his disposal, but he reminded us why it might be time for him to contemplate retirement. Manning was only hurried 3 times throughout the entire contest. T-H-R-E-E. The Saints went into week 4 giving up the most fantasy points to the QB position. His efficiency needs to improve if the Giants want to flirt with the idea of going to the playoffs. O.J. Howard (0 pts): he left the game due to an injury and everyone who had stock in him shed a man-tear. Sorry, not much we could do here. If he continues to miss time, we’ll talk more about Cameron Brate in future articles. Fournette is already ruled out for week 5. With the Chiefs’ giving up an average of 123.2 yards on the ground per game, T.J. should ball out. He’s already doing so on the regular. Fire him up and save $3,800 if you don’t get Gurley at $9,400. 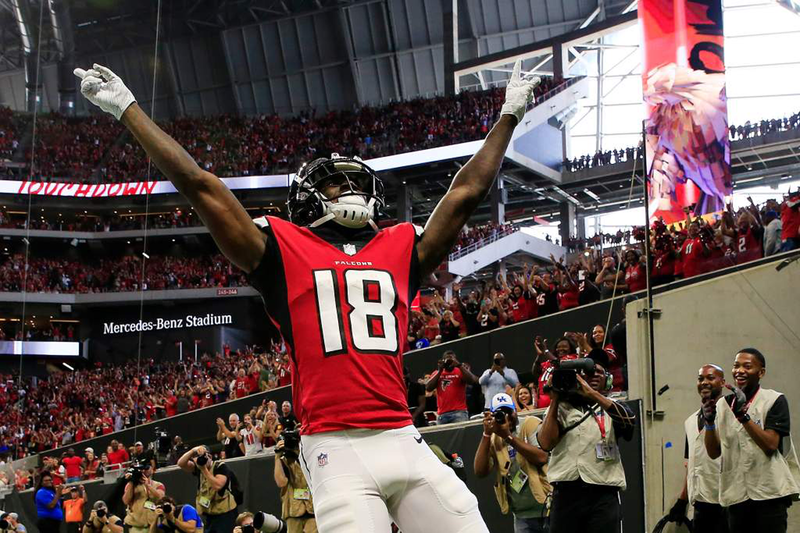 Calvin Ridley, WR (ATL) $5,800: If Ridley maintains his pace over Saquon, it’s not far-fetched to believe he could finish as the Offensive Rookie of the Year. Yes, his 6 TDs over 4 games is historically and statistically improbable. However, Ridley should easily finish with over 1,000 yards and double-digit scores. This week, Matt Ryan and company get the Steelers, whom surrender 304.8 passing YPG and have already watched 12 passing TDs go by. Surprisingly, Ridley (WR12) is $2,000 cheaper than Keenan Allen (WR32). Chris Thompson, RB (WAS) $5,900: Though the Saints are pretty stingy against opposing RBs, only giving up 79.5 rushing YPG and 3 TDs, Thompson’s contribution to the Redskins are through the air in majority. He averages 5.5 YPC and 7.75 YPR, with 20 receptions and 155 receiving yards in 3 games. Let’s not forget that the Redskins are coming off of a bye and AP is still dealing with a lingering ankle injury. He’s also scored 20+ points in 2 of his 3 games. I like him this week. Tyler Boyd, WR (CIN) $5,700: Beyond the fact that Boyd has scored 20+ points in his last 3 games, speedster John Ross is out this week against the Browns. The “Red Rifle” is also having a strong season and I expect Browns #4 overall pick in this year’s draft, Denzel Ward, shadowing A.J. Green for the day. At Boyd’s sticker price, he’s $2,300 cheaper than OBJ (WR22). Blake Bortles, QB (JAX) $5,500: Stop me if you’ve heard this before. 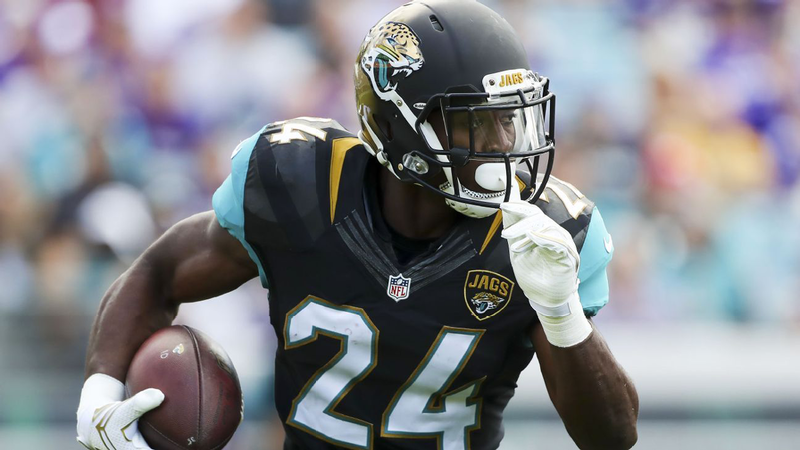 “With Fournette projected to miss the game, Bortles and the WR corps will have a day and amass a ton of points.” That was the general consensus with the Jags in week 3 against the Titans, where the final score was 9-6. Not a single TD was thrown by either team. Week 5, the Jags take on the Chiefs. It will either be a shoot out or another low scoring affair. Bortles is a cheap, sneaky play against a defense that gives up 328.5 YPG and 2 TDs through the air, which is the league’s second worst. Titans, DST (TEN) $4,000: Not to state the obvious, but the Bills are arguably the worst – or second worst – team in football right now. All depends on what fan you ask. The Bills rank 31st in total offence. 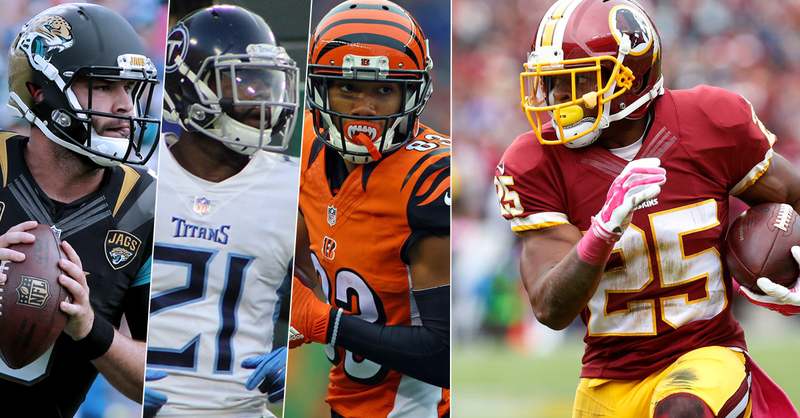 They average 12.5 PPG, 220.8 total YPG, rank last in 3rd down conversions and yards per play (3.7). It’s just depressing if you’re a BIlls’ fan. The Titans defense also score an average of 9 PPG, which ranks them only behind the Rams, Packers, and the Jets. Not too shabby. The salaries are taken from Draftkings. Entering 50/50 contests is the absolute best way to win and double your money. If you decide to go all in and chase the big money, just be sure to enter a few 50/50s to ensure you win your money back. Let’s get ready for another exciting week and good luck to you and your lineups!